Entertainment social network, GetGlue.com, has launched a has launched a host of new sports partnerships as it looks to expand its functionality into sports viewing. GetGlue is a social network for entertainment, which says it has more than 900,000 users and 12M ratings and check-ins for TV shows, movies, music and books each month. Fans use GetGlue apps to check-in while consuming entertainment, to share with friends and to earn rewards. The site's new release focuses on sports in a big way. 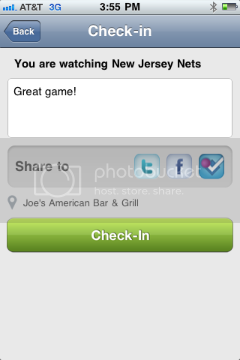 Users can now check-in to their favorite team and share with friends that they are watching a game or event. The check-in experience is the same as GetGlue check-ins for TV shows, movies and music. By checking in repeatedly to your favorite sport/team or event, you can level up to become a GetGlue Fan and Superfan, earn stickers and become the Guru. In conjunction with launching a Sports button, the network has announcing rewards from sports leagues and sports networks. At launch, you will be able to earn rewards from NHL (NHL Stanley Cup Playoffs), Turner Sports (NCAA Tournament), San Antonio Spurs, FOX Sports (MLB and NASCAR events), HBO Sports, Showtime Sports, NFL Network, Speed, FOX Soccer Channel, FOX College Sports, Fuel TV and the Big Ten Network.